You may have heard of him through the media or on the internet, you may even have experienced one of his heart warming hugs. Recipient YMCA Canada 2007 Peace Medal for his contribution to society as a pioneer of the “Free Hugs” phenomena that swept the world in 2006, Martin Neufeld continues to explore ways to express his life’s experience through his art and create compassionate art out of his life. 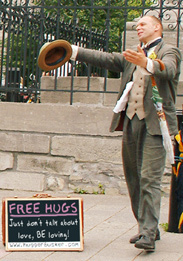 In 2004, moved by a profound desire to bring peace to the world Martin Neufeld created a cheerful and endearing alter ego “the Hugger Busker”. His adventure as a provider of tender affection and loving-kindness quickly evolved over the next five years into a deeply personal and spiritually transformative journey. 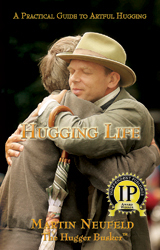 Hugging life, the title of his award winning book, become his voice, his philosophy, his mission, inspiring and delighting hundreds of thousands of people around the world. Since he first wrote “Free Hugs” on his sign in 2004 he has shared over a quarter million hugs. Busker: an entertainer (clown/juggler/musician/etc..) who performs in outdoor public spaces (street corners, parks, public squares, etc…) earning his living from the generosity those he entertains. The Hugger Busker is socially interactive performance art. It is a fascinating social study of human nature in which the public is both spectator and performer in an ever evolving scenario. Whether active or passive they become participants in this theatre of life that can but enrich their journey through the day. Each passerby has a story to tell. It is in their reactions to my proposition of shared human affection and unconditional love, in the form of Free Hugs, that their character is revealed and their personal story unfolds. To many my stillness makes them believe that I am a statue and at first sight it is this that entertains, but slowly it is reveled that there is much more to my immobility. For the truth of the matter is that I am simply waiting with an open heart for someone, anyone to approach me so that they may receive a loving, heartfelt hug and a tender greeting. I became a performer to touch, inspire and entertain people. I always believed that the actor’s role in society was to be a social catalyst in which human nature in all its shades is brought to light in order to stimulate reflection, action and possibly change within individuals and society as a whole. An idealistic notion I know but that is what I believed then and continue to believe today. In my 20 years of work as a performer I all too rarely felt that my work affected people in the positive ways that I hoped. For the first time in my professional and personal life, I have finally found a way in which my performance work can directly affect another’s life in a positive manner. To hug people, to give love to the world is not only meaningful for me but also personally nurturing. Every hug I gave, every tender word I exchanged not only moves others but was transformative for me as well. I didn’t see this as a job or a vocation but rather a calling. I was following the voice of my heart and at that moment in my life Free Hugs was my path and a delightful and memorable one it was. To spend my days smiling, loving, laughing with other has brought much happiness and comfort to my life and for that I am grateful that God has led me on this wonderfully inspired journey. Today I still open my heart and arms to strangers but I do so in different ways as for me hugging means to care for so the form is very fluid and ever changing, just the way I like it.